Eagle Animal Hospital promotes a fear free environment and employs vets who have participated in Fear Free training and certification. The Fear Free training and certification program helps veterinarians modify their procedures and handling techniques to reduce anxiety in veterinary visits. The fear free initiative promotes considerate approach and gentle control techniques in a calming environment. 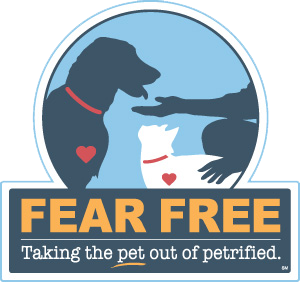 Utilization of Fear Free methods and protocols lead to a reduction or removal of anxiety triggers, which creates an experience that is rewarding and safer for all involved including pets, their owners and veterinary health care teams.